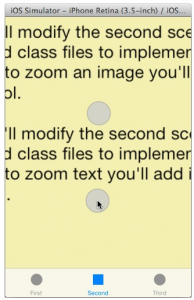 The zooming function of the Scroll View control enables the user of your app to use pinch gestures to zoom an image or text content in and out. Last week you learned how to scroll (pan) a large image vertically and horizontally. 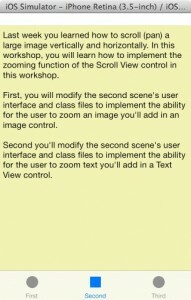 In this workshop, you will learn how to implement the zooming function of the Scroll View control in this workshop. First, you will modify the second scene’s user interface and class files to implement the ability for the user to zoom an image you’ll add in an image control. Second you’ll modify the second scene’s user interface and class files to implement the ability for the user to zoom text you’ll add in a Text View control. I will walk you through the steps you’ll have to perform to enable the app user to zoom an image you’ll add in an Image View control. Click the Main.storyboard file, then add a Scroll View control on the second scene’s canvas. Make sure it cover the view’s surface as shown in this image. Next, add an Image View control on the Scroll View. Adjust the control’s Width and Height attributes in the Size inspector pane to cover most of the Scroll View’s surface, as shown in the image below. 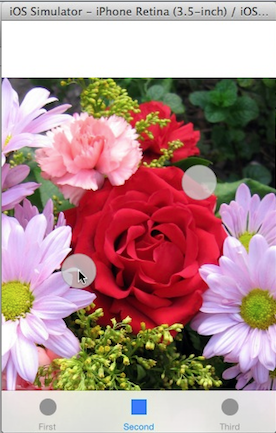 Set the Image View control’s Mode attribute to Aspect Fit. You’ll find that attribute under the View category. 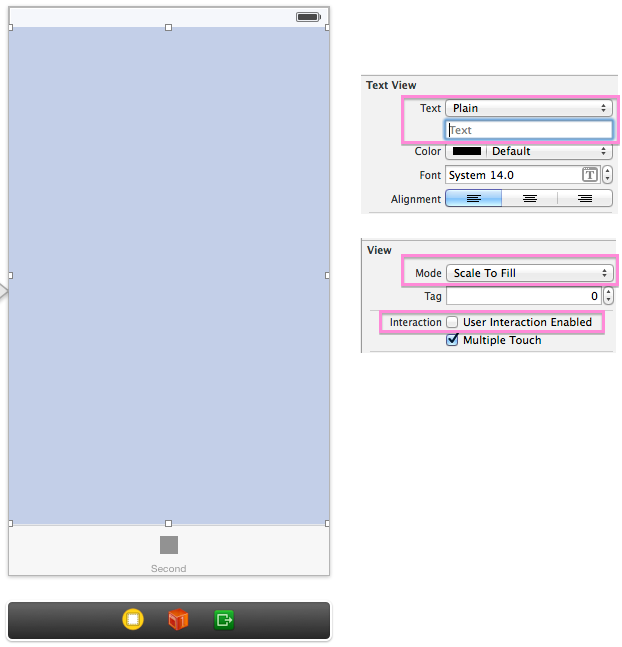 You should connect the Scroll View control and the Image View control to the property variables in Interface Builder. 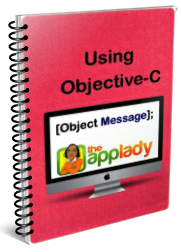 Control-click from the View Controller object that’s on the second scene’s Dock to the Scroll View control in the Document Outline. Release your mouse and select scrollView from the Outlets menu. Here is the first set of code to add in the SecondViewController.m file. The second statement set the Scroll View control’s delegate property, since we will be using a delegate method of the UIScrollViewDelegate protocol later on. When the app user use the pinching gesture to zoom in and out, you’ll have to set the zooming limits. The last two statements does exactly that. Now, replace the viewDidAppear: method’s code with this. The final piece of code you have to add in the SecondViewController.m file is this delegate method of the Scroll View control. It is fired when the app user execute a pinch gesture. As you can see the method contain a single statement, which return the image the user will apply the pinching gesture. You’ve entered necessary code to implement the Scroll View control’s zooming function, so go ahead and run the application. 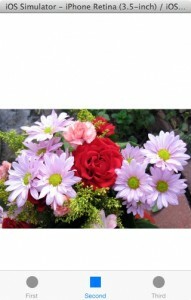 Now, click the second tab and you will see the flower image, as shown in Figure 1 below. Since you are working on the simulator you’ll have to hold down the option key, resulting in two gray circles appearing on the image. Now, click-drag your mouse to simulate the pinch gestures. Your screen will look similar to Figure 2. Notice you can even scroll the view when you’ve zoom in the image. 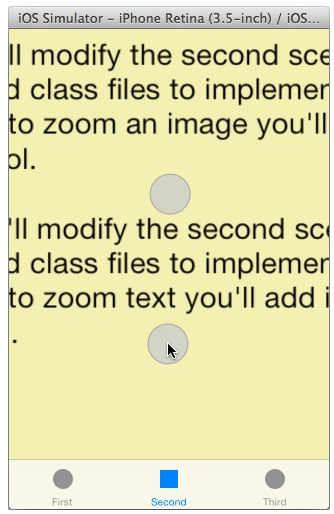 That’s all there is to implementing the Scroll View control’s zooming function on an image. Now, I will walk you through the steps you’ll have to perform to enable the app user to zoom text you’ll add in a Text View control. 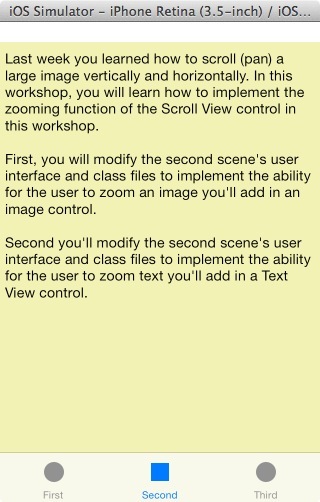 First, modify the second scene’s user interface by adding a Text View control on Scroll View control. 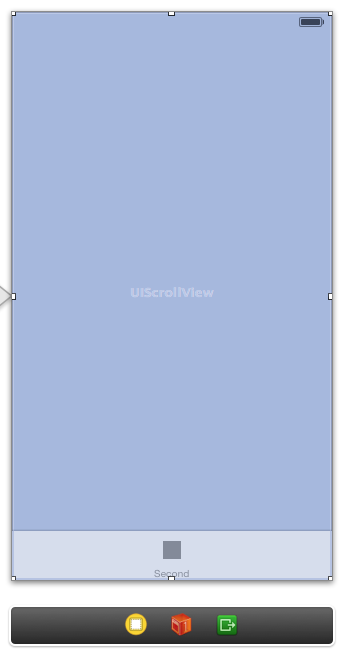 Make sure it cover most of the Scroll View as shown in the image below. In the Attribute Inspector pane, set the attributes highlighted in the image below for the Text View control. Run the application to test the code you entered in the viewDidLoad: method. Figure 1 shows what the second tab’s view look like before you zoom the text. Figure 2 shows what the view looks like when you zoom the text. That’s it. 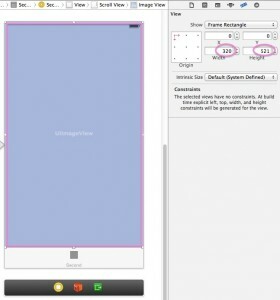 You now know how to implement the ability for the app user to zoom an Image View control’s image and a Text View control’s text.